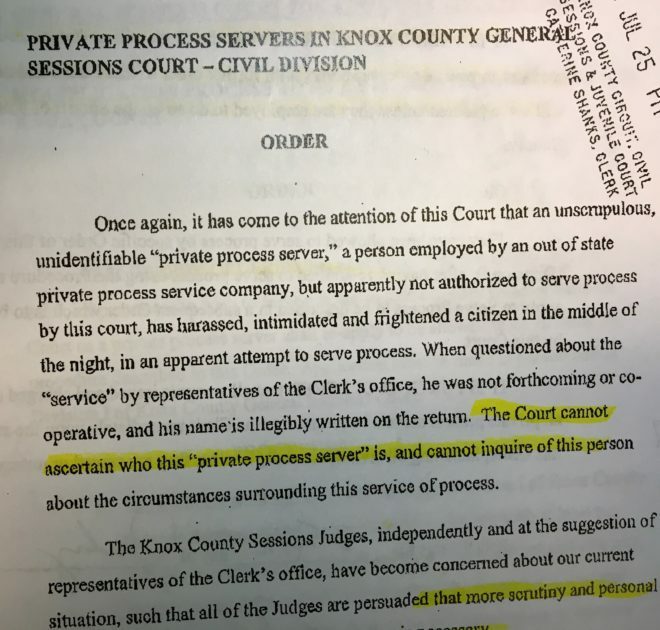 “Citing rogue process servers who harass people in their homes, Knox County judges are moving to exert greater control over civilians who serve civil court papers. An order signed Tuesday by Knox County General Sessions Court Judge Chuck Cerny halts civilians from performing private process and directs that the work go exclusively to the Knox County Sheriff’s Office. Cerny, presiding Sessions Court judge, said he and the four other Sessions Court judges will allow private process servers to do the work. But they’ll all have to apply through a procedure to get it. He’s also pledging the court will watch them with a much closer eye. This week’s action is prompted by a recent incident involving an “unscrupulous, unidentifiable private process server who harassed and scared someone in the middle of the night,” according to Cerny’s order. “I felt like doing something kind of immediate in response to this one particular incident was justified at this time,” Cerny said Thursday.